WSG's 2019 Meeting of the Americas and Q1 Board of Directors meetings were held recently, and I am pleased to report that our network continues to advance and grow through partnerships, new membership and recruitment, group development and collaboration. During the Meeting of the Americas, WSG specialty groups met and discussed objectives and initiatives for the upcoming year. The Emerging Leaders Group (ELG), a group formed to develop the professional advancement of future firm decision makers, participated in presentations and formulated goals and action items for the upcoming year. The Women's Professional Forum also met and discussed leveraging the power of the group to build business, compiling a database of female expert speakers and other related best practices. To date, WSG has held seven meetings with representation from over half of all member firms. Upcoming meetings include the Asia Pacific Regional Meeting, 23 - 24 April in Singapore; the European Regional Meeting, 28 - 30 May in Reykjavik, Iceland; the Annual Meeting, 4 - 6 September in Washington DC, USA; and many other Practice and Industry Group meetings. Visit the WSG website to find more information on all 2019 meetings and events. 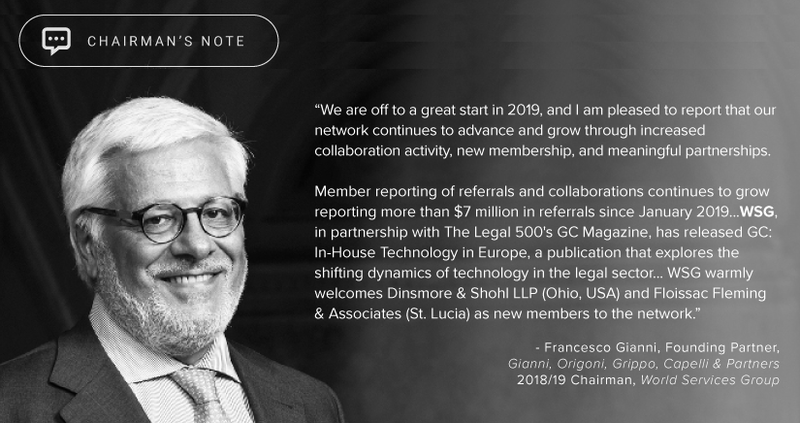 I am excited to say that WSG, in partnership with The Legal 500's GC Magazine, has released GC: In-House Technology in Europe, a publication that explores the shifting dynamics of technology in the legal sector. Through this collaboration, WSG hopes to increase its visibility and raise awareness of the network and its benefits. Please visit The Legal 500's website for more information. On the membership front, I am delighted to announce that the Board has approved two new members to join our network: Dinsmore (Ohio, USA) and Floissac Fleming & Associates (St. Lucia). Please join me in welcoming these firms to WSG. Our recruitment efforts continue with an emphasis on filling strategic jurisdictions with high-quality members. I am happy to note that WSG Member participation in reporting referrals and collaborations continues to grow. Since January 1, more than $7 million in referrals have been reported. I urge you to continue sharing your transactions information by using WSG's Referral Tracker, as this is extremely useful information to use in evaluating the value and power of your membership. Finally, I would like to encourage you all to attend one of the Regional Meetings and/or attend the WSG Annual Meeting in Washington D.C. All meetings will feature remarkable guest speakers and an opportunity to network with colleagues across the WSG Network, which is one of the most valuable benefits of WSG membership. We're off to a great start in 2019 and I look forward to seeing you all throughout the year. As always, I am always eager to hear from you regarding our network and how we can work together to improve it.